Read more from Crutchfield writer, Woody S.
Written by Crutchfield's Woody S.
"The best amp we've made — ever!" As you might imagine, we get a LOT of product literature sent to our attention here at Crutchfield. But it's not often that a manufacturer says something this unequivocal when introducing a product. Cambridge Audio is proudly calling the highly anticipated Azur 851A integrated amplifier the best one they've ever made. They've taken all the things you love about Cambridge Audio products — things like solid build quality, muscular power components for clean sound, and convenient connectivity options — and they've stepped them up a few notches to meet their own continuous improvement mission. We'll start where the rubber meets the road: two toroidal transformers, one dedicated purely to the preamp processes, supply the Class XD circuitry with pristine, supercharged power. But let's break this statement down to its nuts and bolts. The toroidal transformers are nearly impervious to hum, buzz, and interference problems experienced by lesser transformer designs. And Cambridge Audio's patented Class XD amplification technology combines the best aspects of two different design approaches: you get the sonic refinements of a Class A amplifier (without the high heat and inefficient power profile), plus the cool-running efficiency of a Class AB amp (with much less of the distortion that sometimes dogs that amp design). So all that clean power can be dedicated to one thing: providing the best quality sound for your speakers. There are 8 RCA stereo inputs available, and two balanced XLR stereo inputs as well. Two sets of speaker terminals mean you can easily feed two rooms with your music, or use them to bi-wire a set of compatible speakers. The unit is ready to be integrated into custom-installed multi-room audio system, with its infrared control input, RS-232 port, and Cambridge Audio-specific control bus. And speaking of that, this integrated amp is a perfect companion for Cambridge Audio's Azur 851C DAC/CD player/pre-amp/network music player. The 851C is a master translator for almost any digital audio source you can name, and will enhance your 851A's already impressive capabilities. A newly redesigned volume control lets you make very fine level adjustments across the volume range. An easily readable, user-friendly display, reminiscent of a fine automotive dashboard, gives you the unit's status at a glance. The analog inputs feature level-trim functions so there won't be noticeable jumps in volume when switching between input devices. The Azur 851A's thoughtful touches and graceful design will present you with a satisfying, solid, yet refined listening experience. When you unpack this amp, you realize it's a beast. It being engineered in the UK, the style and some functions are a bit different then amps engineered in other parts of the word. The end result is I have found an amp that I will never part with. Can I hook the BT100 to the Azur851A? Sorry, no; the BT100 is made specifically for use with the DacMagic Plus and CX series components. Class XD Amplifier Technology: Class XD, a proprietary Cambridge Audio technology, is a unique amplifier circuit design created to offer the optimum sound quality currently available from existing amplifier configurations, while retaining the high power levels required for truly dynamic performance. It was conceived by our London-based engineering team to combine the best of both worlds from Class A and Class A/B amplifier operation. Class XD (crossover displacement), gives the benefits of pure Class A operation at low levels and eliminates the distortion associated with conventional Class B operation as the fragile audio signal passes though the zero crossing point from transistor to transistor. Distinct from Class AB, XD technology feeds a controlled current into the output stage in such a way that the usual Class B crossover points no longer occur either side of zero volume; the worst possible position in terms of distortion - but displaced to a point where the transfer functions of the transistors are better matched, at a significant output level where it is less audible. The system operates outside of the feedback loop so is not directly involved in the signal amplification itself. The result is a smooth and linear transition between the two key operating modes, Class A and B. The benefits of this approach give the sonic refinements of Class A operation and the uncompromising efficiency and power of Class B operation. In fact, the new 851A delivers a gigantic 120 watts per channel; enough for the most demanding speaker set-up. 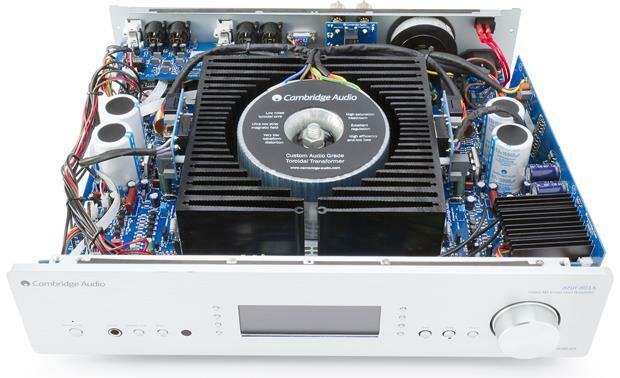 120W x 2Ch Integrated Amp: The Cambridge Audio Azur 851A's Class XD amplifier delivers an impressive 120 watts per channel into 8 ohms, at 20-20kHz, with 0.03% THD at 80% rated power (or 200 watts per channel in 4 ohms). Audiophile-Grade Toroidal Transformers: Capable of delivering an enormous 120 watts of high-quality power, the 851A benefits from two audiophile-grade mains Toroidal transformers; one for the sensitive preamp section and one for the power stages, allowing the 851A to deliver its immense output without stress. The 851A is actually two amplifiers in one: a preamp and a power amp. Underneath the hood it benefits from two high specification, custom-designed toroidal transformers to deliver on its promise of a powerful yet beautifully detailed sound. Following a painstaking assessment period, Cambridge Audio engineers have selected uncompromising, oversized, "audiophile-grade" components for the plethora of benefits they bring such as lower noise, quieter PSU operation, and sublime bass response. Towards the back of the amplifier is the separate, isolated transformer supplying the preamp stage, and located in the center is the main transformer supplying the main power amp stage. These critical components are key to delivering the sonic performance and the power reserves you will experience from the 851A. Balanced Volume topology: The 851A integrated amplifier can be precision-controlled with Cambridge Audio's new fully balanced silicon gate volume control, which gives very fine adjustment (1dB steps) across the volume range and highly accurate channel-balancing. 5-Way Protection System: The 851A benefits from the latest version of Cambridge Audio's sophisticated proprietary protection system. CAP5 (Cambridge Audio Protection 5-way) is an innovative and intelligent circuit that constantly monitors the amplifier, without degrading signal purity, ensuring ultimate reliability. Designed to protect the amp in operation, the system has been developed to leave sound quality unaffected. It incorporates a clipping sensor that reduces the volume to keep levels in a safe range, short-circuit detection, and current and voltage overload detection plus a solid-state temperature sensor for over-heat cut out. Combined, these technologies ensure that Cambridge Audio amplifiers will go on to deliver years of reliable, high-performance sound. Over Temperature Detection: AP5 includes temperature detection which constantly monitors the heat generated by the output transistors. If the monitored temperature reaches a high level (suitably within the limits of the output devices) the amplifier will automatically switch into a fault mode. Over Voltage Detection: CAP5 offers V/I protection by constantly monitoring the output transistors to keep them working inside their Safe Operating Area (SOA). The SOA is a set of limits given by the output transistor manufacturer to ensure reliability. V/I also protects the amplifier against short-circuits on the speaker terminals during use. Short-Circuit Detection: During power up from Standby, CAP5 performs a check on the loudspeaker terminals to see if a short across the terminals has been accidentally introduced. If the resistance measured across the loudspeaker terminals is too low, the unit will remain in Standby mode until the fault has been removed and power up is re-attempted. Intelligent Clipping Detection: CAP5 has the ability to detect when the amplifier starts to clip or overdrive at its output, which can damage loudspeakers and degrade the sound. Clipping distortion is caused at high volume levels when the output signal briefly goes outside the maximum voltage that the amplifier can provide, causing the tops of the signal to flatten off. When CAP5 detects clipping, the volume will be automatically nudged down until CAP5 detects an undistorted output. Full Metal Chassis: The 851A integrated amplifier features an acoustically damped, low resonance full-metal chassis with a thick, brushed aluminum front-panel. Standby Circuit: This innovative new circuitry design allows 851A integrated amplifier to consume less than 0.5 watt of power when in Standby, but itself remains totally isolated and non-detrimental to the sound quality when the amplifier is in operation. 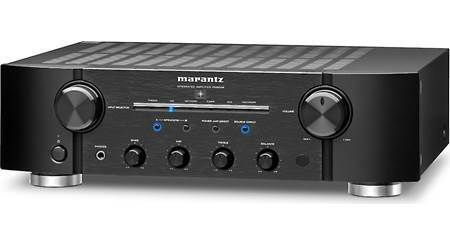 Main Power Switch: The 851A integrated amplifier's main power on/off switch is located on the rear-panel. Standby/On: Once the amp's rear-panel main power switch has been turned On, you can switch the 851A On/Off using the front-panel Standby/On button. Volume: Use the front-panel rotary volume control to increase or decrease the level (-95dB to 0 dB) of the sound from the outputs of the amplifier. The volume control affects the level of the loudspeaker output, the preamp output, and the headphone output. It does not affect the Rec Out connections. Input Gain Trim: The relative levels of the 851A's inputs can be adjusted by the gain trim feature. This allows each input to be adjusted so that each sounds the same in terms of average loudness when you switch between them. Pick the loudest sounding source and trim its level (0 to -12 dB) until it matches the average perceived level of the others. Repeat this process, if other sources also stand out as louder than the average. A/B Operation: The Cambridge Audio 851A integrated amplifier lets you play A speakers only, B speakers only, or A and B speakers together. Direct: This control gives the audio signal a more direct path to the power amplifier stage of your amplifier, bypassing the bass and treble control circuits for the purest possible sound quality. Bass and Treble: The 851A integrated amplifier has independent Bass (20Hz) and Treble (20kHz) controls which can be adjusted from +/-7.5dB. The Bass and Treble controls only effect the speaker and preamp outputs; they do not effect the record outputs. Balance: This control allows you to adjust the relative output levels of the left and right speaker channels. The Balance control only effects the speaker and preamp outputs; it does not effect the record outputs. 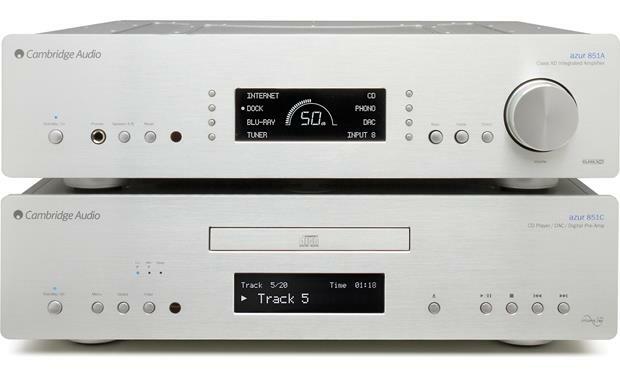 IR Remote Control: The 851A is supplied with an Azur Navigator IR remote control that operates both this amplifier and Cambridge Audio Azur-series CD players. The Azur 851A/C Navigator remote control can also control the basic functions of Apple devices, such as Apple TV and Apple's iPod/iPhone/iPad when docked in a Cambridge Audio or Apple dock (sold separately). Note: The remote operates off of three "AAA" batteries (supplied). 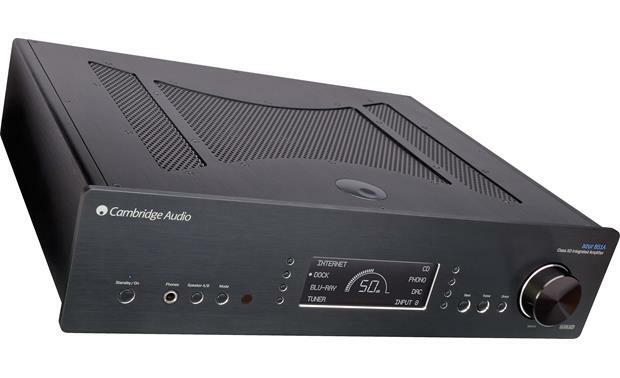 Balanced and Unbalanced Audio Inputs: The Cambridge Audio 851A integrated amplifier is fitted with both balanced and unbalanced analog audio connections. 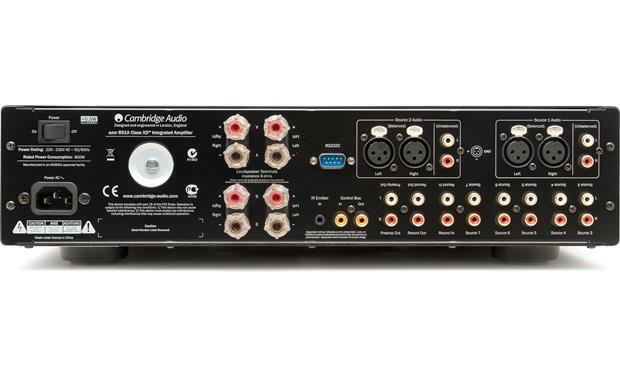 Unbalanced RCA Inputs: The Cambridge Audio 851A is fitted with ten pair of gold-plated analog audio unbalanced inputs (RCA) to connect your external audio sources; such as your Blu-ray/DVD player, AM/FM tuner, CD/SACD player, or Network Player. 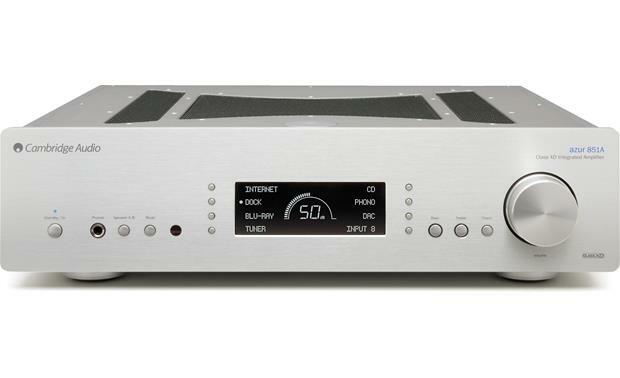 Balanced XLR Inputs: The 851A integrated amplifier features two sets of balanced XLR inputs to connect high-resolution CD and SACD players. XLR is a higher-quality input that can reject noise and interference from equipment with balanced outputs. Note: The 851A integrated amp is not equipped with digital inputs/outputs or video inputs/outputs. There is also no Phono input. 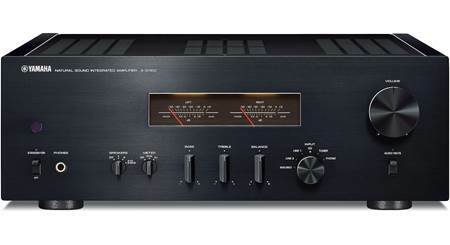 Record Input/Output: The 851A integrated amplifier features a set of gold-plated analog audio inputs/outputs (RCA) that can be connected to a CD recorder, MiniDisc recorder, or tape recorder. A-B Speaker Terminals: The Cambridge Audio 851A integrated amplifier is equipped with two sets of gold-plated, binding-post speaker terminals (labeled A and B). The use of A and B speaker terminals allow you to hook up speakers in another room. When using a single pair of speakers, use speakers with a nominal impedance of 4- to 8-ohm. When using two pairs of speaker, use only speakers with a minimum nominal impedance of 8 ohms. Preamp Output: The Cambridge Audio 851A is equipped with two RCA preamp outputs to connect the integrated amp to an external power amplifier or powered subwoofer. 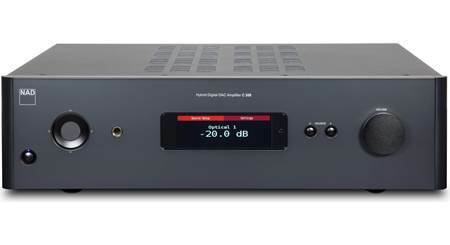 Headphone Output: The 851A integrated amplifier offers a front-panel 1/4" headphone output to connect a set of headphones for private listening. When headphones are connected, the output to both A/B loudspeakers is muted. Use headphones with an impedance of between 32 and 600 ohms. IR Emitter: The 851A features a IR Emitter input (3.5mm) which allows modulated IR commands from multi-room systems or IR repeater system to be received by the amplifier. Control Bus: The 851A features a Control Bus Input and Output (RCA), which allows un-modulated commands from multi-room systems or other components to be received by the amp and loop out to another unit. RS232 Port: The integrated amp's RS232 port is used for control of the 851A in custom install situations from an external controller. A full protocol is available for the 851A on Cambridge Audio's website. AC Power Cord: The Cambridge Audio 851A operates off of standard household AC current using the supplied detachable 6' AC power cord. 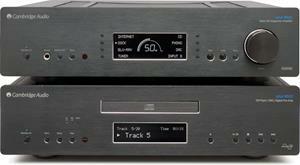 Upsampling CD Player/DAC/Pre-Amp: The Cambridge Audio Azur 851C single disc compact disc player/DAC/pre-amp makes an excellent addition to the 851A. 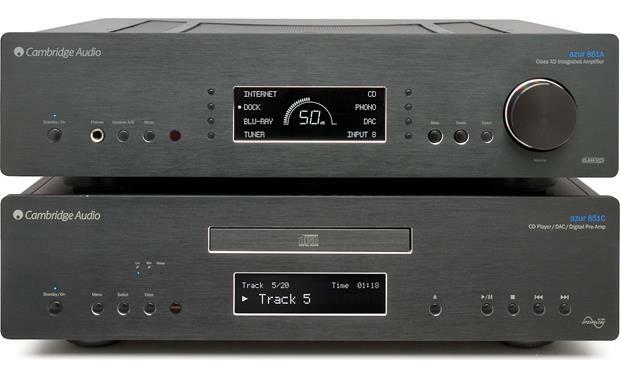 The 851C has been designed to play CD-Audio, CD-Text, recordable CD (CD-R) and re-writable CD (CD-RW) type discs. External DAC: The Cambridge Audio Azur DacMagic Plus is a high-quality up-sampling digital-to-analog converter. 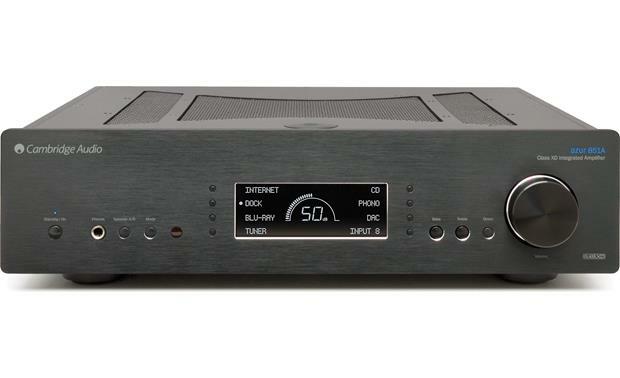 The DacMagic Plus features a range of components to enhance your music listening experience; these include a 32-bit Analog Devices Digital Signal Processor (DSP), dual Differential Virtual Earth balanced filter topology, and twin Wolfson WM8740 high quality DACs in dual differential mode for excellent stereo imaging. Other features include a choice of digital filters (linear phase/minimum phase/steep filter) and an incoming sampling rate indicator which shows the original source quality. 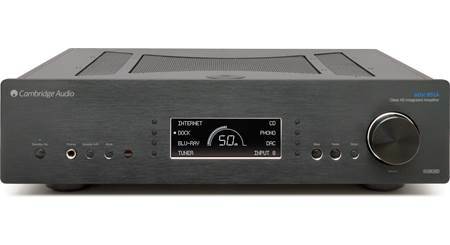 Network Player/DAC: The Cambridge Audio Azur 851N network player enables you to play your favorite Internet radio stations and provides digital inputs to use with the Cambridge Audio 851A integrated amp. Using a wired or wireless Internet connection to your network, it includes Apple AirPlay for iOS devices, Spotify Connect (premium subscription required), Tidal control (subscription required), and the ability to plug in an external hard drive filled with high-res audio. Its built-in audiophile-grade DAC is a perfect complement to the ultra-clean sound from 851A amplifier. How hot does this integrated amp get when running? I am trying to determine where to place it for adequate ventilation. One reviewer mentioned that the unit can be controlled via the iphone. Is that correct? Since this has no network connection, how does that happen? I forwarded your question to an Advisor and they responded with the following: The amplifier isn't controlled by the iPhone. The control in the review is related to another networking music device, like the Azur 851N listed here: http://www.crutchfield.com/p_779851NB/Cambridge-Audio-Azur-851N-Black.html?tp=59309 This can also be controlled with Cambridge Audio's Azur-series CD players listed here: http://www.crutchfield.com/p_779851CB/Cambridge-Audio-Azur-851C-Black.html?tp=197 If you would like to discuss further you can contact an Advisor directly by phone (1-800-324-9695) or online chat. I forwarded your question to an Advisor and they responded with the following: The units we sell are US market and are setup for 110V. If you would like to discuss further you can contact an Advisor directly by phone (1-800-324-9695) or online chat. Searches related to the Cambridge Audio Azur 851A Stereo integrated amplifier.